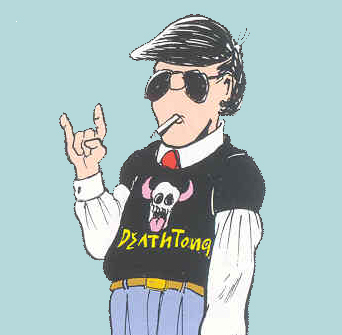 Metal fans are rejoicing today as one of the most iconic fictional bands of the 1980s, Deathtöngue, is finally inducted into the Imaginary Rock & Roll Hall of Fame. As pioneers of imaginary metal, Deathtöngue had a lasting influence on non-reality-based musical history. 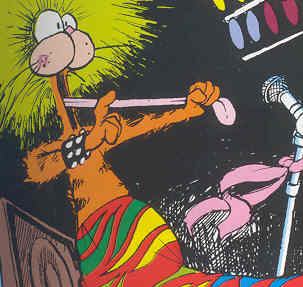 Based in Bloom County, USA, the band’s lineup featured Bill The Cat on lead tongue, Opus The Penguin on electric tuba, and that guy whose name we can never remember but we think he might have been a woodchuck or a beaver or something. Band manager Steve Dallas wrote most of their music, which included the hit singles “Snail Snot From Satan,” “Demon Drooler of the Sewer,” “Leper Lover,” and “Let’s Run Over Lionel Ritchie With A Tank.” Never afraid of controversy, the band famously one-upped Ozzy Osbourne when, live on stage, Bill The Cat bit the head off a roadie. The band broke up in the late ’80s, reformed briefly as Billy And The Boingers, and broke up again after a downward spiral of self-destructive behavior from its tongue player that included reading the Bible and experimenting with politics and televangelism. Attempts to contact any surviving members of the band were unsuccessful. The Imaginary Rock & Roll Hall of Fame was built in 2009 to recognize the significant impact of imaginary music on modern society. 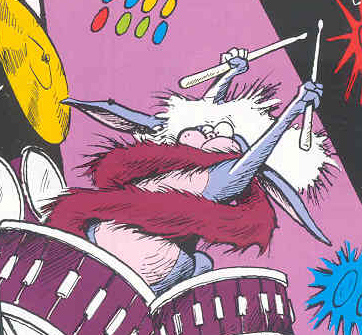 The induction of Deathtöngue will be marked by a special exhibit that will include a bottle of Bill The Cat’s verminous cocaine-laced urine, some of Steve Dallas’s hair grease, and a tuba similar to the one played by Opus. All admission fees will be donated to a charity that provides spaceship-themed wheelchairs to disabled veterans. Guest reporter Carrie Patrick plays both real and imaginary guitar. On the latter instrument, she was recently voted Greatest And Best-Looking Player Of All Time for the 30th consecutive year, by a panel of international experts who live in her head. This entry was posted on April 9, 2012, 11:10 AM and is filed under General Weirdness. You can follow any responses to this entry through RSS 2.0. You can leave a response, or trackback from your own site. OK, first of all, as a journalist, I know Bill the Cat… he’d NEVER go for this! As a journalist, I must agree with you as a journalist. When I studied journalism at Journalism School, where I received a degree, their was no mention of Bill The Cat or this Opus fellow in any of the Journalist texts that we studied journalistically. Bill the Cat what an imaginary legend. Did he exist? In the realms of the deepest, darkest, slightly skewed imaginations imaginable. I’ve just self-combusted. Bill The Cat is a fake! As a former studio musician back in the 80s,,I remember catching Bill having a prayor meeting with a nun..He was NEVER a true rocker! He was only in it for the money!!! I later became a journalist and wrote about it,,but his manager, Steve Dallas ,who was also a lawyer, hit me with an injunction order and kept me from publishing it. Bill the Cat is not a fake, but an entity masquerading under the guise of “Kill the Bat” and eat his cake, too. The imaginary R & R Hall of Fame is a terrific concept, and I know that my solo theremin hit of 1996 is honored therein. the woodchuck-looking guy was named “Portnoy”, I think. Awesome! I had the same T-shirt that Steve Dallas is wearing! They were sold out at the imaginary DeathTongue concert, so I had to actually make it myself in graphic arts class. 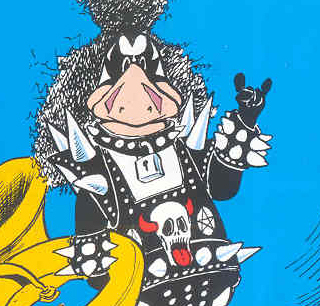 NOBODY plays the electric tuba like Opus. Check out his solo on “Let’s Run Over Lionel Ritchie With A Tank” or his hot tuba line during “The Devil’s Sister’s Divorce.” I get goose pimples just thinking about it.